The 2016 Honda CR-V holds a firm lead over all other crossovers by supplying Goshen and Monroe drivers with state-of-the-art comfort and convenience features. Even the entry-level LX trim level comes with a phenomenal selection of standard features, and you’ll only be more impressed as you advance up the model line. Overall, the CR-V offers everything you need to stay connected, comfortable, and totally stress-free. Bluetooth HandsFreeLink: Bluetooth handsfree calling comes fitted across each and every trim level, so you’ll be able to take and make calls without having to take your eyes from the road or your hands from the wheel. SMS Text Message Function: Plenty of Goshen and Monroe families communicate as much by texting as they do by calling, so the CR-V comes standard with the ability to read those incoming messages aloud. HondaLink: The HondaLink Next Generation system allows users to connect their smartphones up to the CR-V, then use a variety of downloadable apps across the vehicle’s systems. The 2016 Honda CR-V makes your morning commute more manageable by bringing a wealth of standard and available comfort features for you to enjoy. Creating a home away from home, it takes the hassle out of every drive. 10-Way Power Driver’s Seat with Power Lumbar Support: Moves across multiple planes of motion at the mere touch of a button to fit precisely around your body and provide complete support. Leather-Trimmed Seats: EX-L trim levels above allow all occupants to relax into rich, supple leather seats at the end of a long day. Dual-Zone Automatic Climate Control: Both the driver and front passenger are provided with their individual temperature control settings. Power Liftgate: Hands full of shopping? 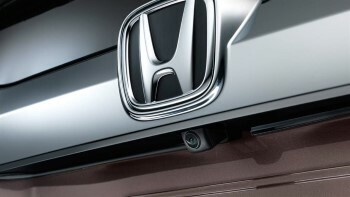 No need to worry, the CR-V’s available power liftgate will open up at the touch of a button. Multi-Angle Rearview Camera with Guidelines: With three viewing modes (Normal, Top-Down, and Wide), plus guidelines to help you maneuver, backing up in the CR-V feels effortless. Honda Satellite-Linked Navigation System: Use either voice recognition technology or the 7-inch touchscreen to enter your destination, then receive turn-by-turn directions until you arrive. Honda HD Digital Traffic helps you stay ahead of gridlock. The 2016 Honda CR-V has been designed around the needs and wants of American drivers, and it’s able to fulfil requirements they didn’t even know they had. To experience its comfort and convenience features for yourself near Monroe and Goshen, just visit the showroom at Middletown Honda.